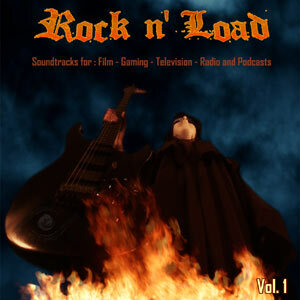 Rock n' Load - Vol. 1 is a rock guitar instrumental soundtrack compilation of 10 ripping tracks designed for indie and professional film makers, game developers, television programmers, radio stations, internet podcasters and also equally for music fans who seek to jam at home or in the car hi-fi system. With rocking sounds of action and epic'ness with tracks like "The Knife", "Stomper" or "Spiders", Rock n' Load Vol. 1 also offers a cascade of feel good vibrations with Blues, Funk, and Psychedelia on "Tipsy", "FunkedUp", and "Blue Tattoo". The full featured album download offers two versions of each track; Full length and a quick 30 second edit, which is ideal for shorter ad spots or segment segues. Whether you chose to slice, chop and mash it up on your visual art presentations or smack it on loop and groove to the moods in your headset, the soundscapes of Rock n' Load - Vol. 1 will take you on the road to the world of rock n' roll. If you use the soundtracks on your video artwork, please do contact us, we would love to see your creations!